Like the books of Matthew and Mark, we learn from the Book of Luke the stories of the birth of Jesus Christ and John the Baptist. Luke tells us that the angel Gabriel appears to Zechariah, telling him that his wife Elizabeth, formerly barren, is pregnant. Soon afterward, Gabriel appears to Elizabeth’s relative, the Virgin Mary, telling her that she too is going to give birth to a child by the Power of the Holy Ghost. Mary and Joseph travel from their home in Nazareth to Bethlehem to pay taxes to Herod, it is in Bethlehem, in a manger, Jesus is born. Later in a younger age, Jesus was found instructing older men of great wisdom in the temple. Once Jesus grows to the age of about 30, He is baptized in the desert of Judea by John the Baptist. John is soon imprisoned by Herod, the ruler of the northern Galilee region. We learn of Jesus’s genealogy, stretching back to the first man, Adam, who is said to be “… the son of God.” (Luke 3:38). We are told of Satan unsuccessfully testing Jesus for forty days in the wilderness. Upon returning from being tempted in the wilderness, Jesus begins his ministry. He is rejected in his hometown of Nazareth and takes to wandering throughout Galilee, where he works many miracles, including casting out devils. • In Chapters 1-4: Luke writes a very detailed account of the birth of Jesus, a common Christmas story, yet always fascinating. He then explains John the Baptist’s preparation for the coming Messiah and the baptism of Jesus Christ. • In Chapters 5-21: We learn of the ministry of Jesus. As Jesus travels, He teaches, preaches, heals the sick, and brings hope to the desperate and discouraged. He was also seeking those who were obedient and faithful, such as the Roman Centurion who sincerely pleads with Jesus to heal his servant from a far distance, “…say in a word, and my servant shall be healed.” (Luke 7:7). Jesus met many religious leaders who relentlessly opposed Him and constantly tried to trick and kill Him. • In Chapters 22-24: Jesus is betrayed by one of His own (Judas). He was unlawfully convicted by a dishonest and hateful court, and sentenced to crucifixion. However, death could not hold Him and after three days He resurrected and arose from the grave, just as He had miraculously raised others during His ministry. When the followers heard these words, they remembered. The followers left to tell the Eleven Apostles, but the Apostles thought they were listening to idle tales, and did not believe. Peter ran to the tomb to see for himself; but departed wondering what would happen. Later, on the way down to a village named Emmaus two of the Apostles walked while discussing the things that had happened. While walking a man approached them and began to speak to them, this man was Jesus Christ, but the two Apostles did not know Him. Jesus asks them why they are sad, and what the reason is for their communication. The two Apostles are flabbergasted as to why this ‘man’ would ask them these questions, they begin to tell Him about the ministry of Jesus and how He was crucified. Jesus responds; “…O fools, and slow of heart to believe… Ought not Christ to have suffered these things…” (Luke 24:25-26) Jesus explains that He has further to walk, but with the evening approaching, the two Apostles invite this ‘man’ to stay with them for the night. While with them, He breaks bread and communes with them, after He is done breaking bread, he disappeared. Upon realizing that the ‘man’ who was with them was Jesus and He had now left after breaking bread with them, they were perplexed; “…Did not our heart burn within us while he talked with us by the way, and while he opened t us the scriptures?” (Luke 24:32) Essentially the two Apostles were upset that they were so blind to not even see Jesus! Here is an important Doctrinal Truth: Jesus Christ has a glorified body of flesh and bones, just like we have as humans. Jesus told His Apostles to touch Him for He had flesh and bones, and He even asked them for food, so that He could eat. Jesus then “…opened… their understanding, that they might understand the scriptures… Thus it is written, and thus it behoved Christ to suffer, and to rise from the dead the third day… that repentance and remission of sins should be preached in his name among all nations, beginning at Jerusalem. And ye are witnesses of these things.” (Luke 24:45-48) Jesus opens their understanding, so that the Apostles and all those who follow Him can understand the scriptures and know the truth. Jesus had told the people He would be persecuted to death and rise again on the third day, but even then when it happens the Apostles did not believe Him. Jesus explains that His death had to happen, in order to open the door to a remission of sins and the start of missionary work throughout the world, starting in Jerusalem. Jesus died for ALL of us, that we might be saved. In order to be truly saved, we must follow Jesus, and all His teachings. We cannot follow Him, if we do not follow His commandments and teachings. Jesus is lifted up into heaven and the Apostles rejoiced and worshipped Him in the temple. Jesus Christ is led to speak with Pilate, who finds no fault in Him. When Pilate finds that Jesus was from the area of Galilee, governed by Herod, he sends Jesus to him, because he had jurisdiction. Herod and his men mocked Jesus and arraigned Him in a gorgeous robe as an insult to the “King”, Herod sends Jesus back to Pilate. Pilate confirms again that he has found no fault in Jesus, but as tradition he must release one prisoner at the feast. The people cry out for Jesus to be crucified, and after Pilate made it clear that he found no fault, he gives into the demands of the people and releases Barabbas instead of Jesus. Jesus is sentenced, without trial to be crucified and Pilate “washes his hands of the situation”, as to not be held accountable for the death of Jesus. After beating Jesus almost to death they force Him to carry His own cross to Calvary to be crucified, but so weak, the soldiers ordered a man named Simon to carry His cross for Him. On His walk to imminent death, women follow Him wailing, He comforts them and tells them; “…Daughters of Jerusalem, weep not for me, but weep for yourselves, and for your children.” (Luke 23:28) Jesus knew that there soon would come great calamities. Jesus is crucified between two thieves, and cries out to His Father; “…Father, forgive them; for they know not what they do…” (Luke 23:34) Jesus knew that the people were limited in their light and knowledge and because of the hardness of their hearts, they knew not what they were doing; crucifying their Lord and Savior. Those gathered to witness this atrocious act of the murder of Jesus Christ mock Him and tell Him that if He was the Christ, He could save Himself. Above His head read a sign; “…THIS IS THE KING OF THE JEWS.” (Luke 23:38) Jesus soon gave up the ghost, but before he turned to the two criminals being crucified with Him and said; “…To day shalt thou be with me in paradise.” (Luke 23:43) Jesus commended His Spirit unto the Father and died. After the death of Jesus, a man named Joseph went and asked for the body from Pilate, who granted his wishes that Jesus have a proper burial in a sepulchre, in the tomb of Joseph of Arimathea. The Passover was approaching, and Judas Iscariot was possessed by Satan, who led him to the chief priests who desired to kill Jesus, Judas agrees to betray Him for money. “…he took the bread, and gave thanks, and brake it, and gave unto them, saying, This is my body which is given for you: this do in remembrance of me. Likewise also the cup… This cup is the new testament in my blood, which is shed for you.” (Luke 22:19-20) Jesus instructed them saying that the Bread was His body and the wine (or water) was a representation of His blood, which was shed for them (or would be soon shed for them). Jesus predicts that evil shall befall his betrayer [Judas Iscariot]. Jesus intervenes in an argument about who is the most important disciple; Jesus explains to them that he who does the most service is the greatest among them. Jesus goes on to explain that the disciples will sit on thrones in God’s kingdom, judging the twelve tribes of Israel. Jesus tells Peter that before the night is over he will betray Him three times, by denying Him. Jesus is smitten and mocked, all because the people’s hearts had been hardened and could not see the amazing miracles performed by Him. Jesus saw the rich men casting their gifts into the treasury of the Temple, He also saw an old lady who cast in two mites. Jesus then tells those around Him that the old widow had donated more into the treasury then all the rich, because she had given everything she had! Jesus explains that the signs of the Second Coming will be when we hear of wars and see great natural disasters and the spread of disease. Jesus tells His followers to not worry, for these things are all part of the master plan. He calms them; “Settle it therefore in your hearts not to meditate before what ye shall answer. For I will give you a mouth and wisdom, which all your adversaries shall not be able to gainsay nor resist… In your patience possess ye your souls.” (Luke 21:14-15,19) Jesus was basically saying that we don’t need to worry about what we need to do, because God will give us wisdom, to confound even our enemies. If we are patient, we will overcome. His commandments and pray always will escape the nightmares of the world in distress at His Second Coming. “…A certain man planted a vineyard, and let it forth to husbandmen, and went into a far country for a long time. And at the season he sent a servant to the husbandmen, that they should give him of the fruit of the vineyard: but the husbandmen beat him, and sent him away empty. And again he sent a third: and they wounded him also, and cast him out. Then said the lord of the vineyard, What shall I do? I will send my beloved son: it may be they will reverence him when they see him. In this Parable, God creates the world and gives men to rule over it, but he sends servants (the Prophets) to check up on those who are entreated to protect and take care of the world and others. After several attempts, God sends His Only Begotten Son, Jesus Christ… but they too kill him. Jesus then asks those gathered, if the Son was killed, how much more of punishments will the Father give, when he returns? Those gathered against Jesus, sought to kill Him, but feared the retaliation of His followers, so they left… but sent spies to watch Him. “…Master, Moses wrote unto us, If any man’s brother die, having a wife, and he die without children, that his brother should take his wife, and raise up seed unto his brother. Essentially in the next life Marriage would not be performed, but if the wife had married all the brothers, then God would sort those things out. (I have included a 3 part video: ‘Joy to the World’ to accompany the story of CHRISTmas) Enjoy, and Merry Christmas! Tis the season for Rudolph the Red Nosed Reindeer, Jingle Bells and of course; Santa Claus! It is the season of bad traffic, great store sales and angry shoppers fighting over some “must have” electronic or gadget. During this HoliDAZE, we often forget the true meaning of Christmas, that is Jesus Christ, our Lord and the Savior of the World. It was part of the law in those days for every man to go to his village to pay taxes; Joseph went to Galilee, because that is where he needed to pay his taxes. 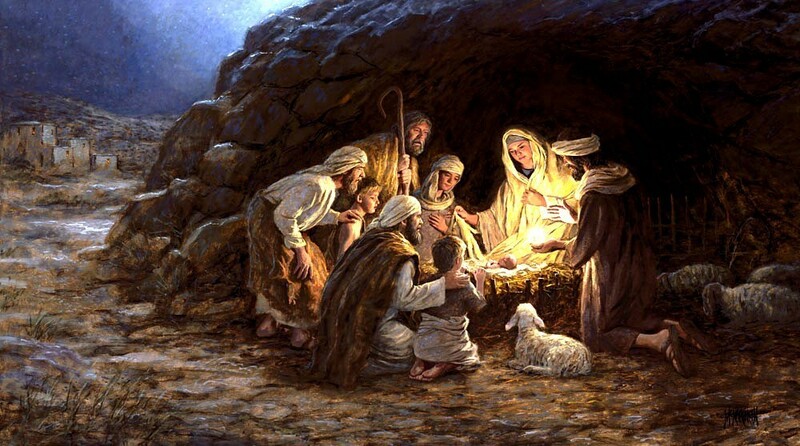 Because of the great number of people there, they were unable to find a proper place to sleep, and were forced to deliver the baby in a manger. The Son of God was Born, His name; Jesus Christ! What Does the Book of Mormon Say? When the evening came, and then the night, the sun did not go down. This made many who believed and disbelieved to fall to the earth in fear. However, the sign had been given, fulfilled and a new star did appear. The announcement of the coming of Jesus Christ did not just come unto the people of the old world, in the Middle East. Rather, God the Father made the announcement to ALL His Children, in ALL parts of the world. The Book of Mormon: Another Testament of Jesus Christ teaches of His divine mission, and anyone who thoughtfully and prayerfully reads it will come closer to Him. This Christmas, remember CHRISTmas, for Jesus Christ came unto the world, to be rejected and die for all the sins of mankind so that we might be given the gift of Salvation and Eternal Life.